OS X doesn’t provide menu-bar access to screen resolutions, but there are plenty of third-party apps that can do the trick, including Eye-Friendly, Pupil, and QuickRes. ResolutionTab 1.1 (Mac App Store link) joins the fray and the $2 app is a viable option. Like the other apps, ResolutionTab sits in the menu bar. Click on its icon, and you can select the resolution you want for your screen. ResolutionTab support multiple monitors, and it senses where your menu bar resides and notes that display as the Main Display. If you have a Retina MacBook Pro, the developer says that HiDPI modes for the 15-inch Retina laptop are on by default, but you have to turn on HiDPI mode for other Macs. There are two ways to do this, which are detailed in the ResolutionTab support site. The 11-inch MacBook Air does not support HiDPI. ResolutionTab allows you to set a global keyboard shortcut for switching back and forth between the current and previous resolutions. A nice touch, though you’ll have to figure out a key combination that doesn’t conflict with one currently in use. 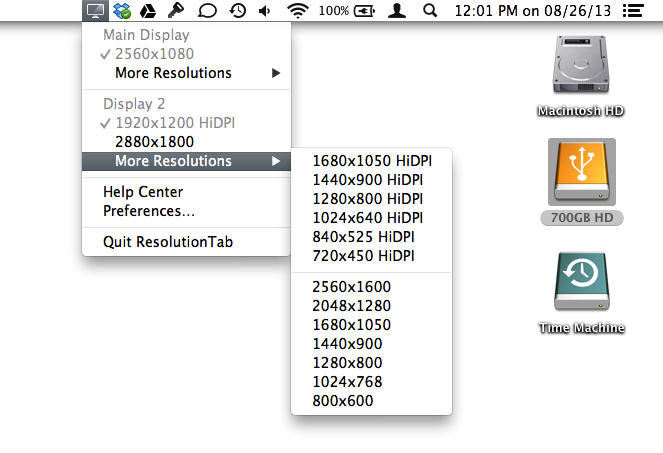 Get quick access to difference screen resolutions for your displays.